There’s no denying it, Queen Bey is not only fierce on stage, she dominates the style scene as well. With her keen fashion sense, everyone can’t help but watch in awe as she goes from style to style each and every season. But it’s not only the designer clothes and lavish costume changes that make her shine both onstage and in real life. Bey really knows when to let down her lovely locks. The recent Grammy’s had her sashaying in a black embellished gown with her splendid mermaid waves. The simple style may make her more human but it somehow added immortal elegance to her look. When ombre became a hit last year, Beyonce worked it up with her waves and opted for a glam look by having sparkly lippies and tons of mascara at the Billboard Women in Music Luncheon. An exaggerated look is avoided by gently blowing back the hair off the face. This resulted in a natural ombre hairstyle that complemented Beyonce’s sun-kissed skin. Clearly nothing is ever typical for the queen. Even with a ponytail hair style, the higher it is the prettier she becomes. Beyonce is beyond ethereal with her gorgeous sheer gown, a feline make- up and a super high ponytail at the Met Gala. To get this look, wrap some hair at the base of the pony tail to cover the elastic band. Parted Long Hair. For her down times that are often spent walking around town and in parks, Beyonce sports her long hair with a messily tousled center- part style. The messy effect is done with a hair gel creating an effortless style. If there’s one thing that defines Queen Bey’s locks it would be her big, curly hair. She instantly becomes a stunner with every party where she has her curls added with so much volume. It is a fierce style that is in contrast with her cute face but nevertheless make her look stunning. Though she gets most of the attention with a curly style, Beyonce could surprise everyone whenever she goes for a simple, straight haircut. It makes her look softer when added with side bangs. Another noteworthy among Beyonce hairstyles is her signature romantic straight layers. It is simple, layered, parted at the side, and are swept on the front. This style looks sleek and always makes her a tad prettier. Anyone can also follow this hairstyle as this would look great with any face shape. For her rather formal commitments, Bey sometimes goes for an elegant braided bun. A braid that is secured in a bun and arranged on the nape does not take so much skill to do but surely takes gorgeousness level a notch higher. 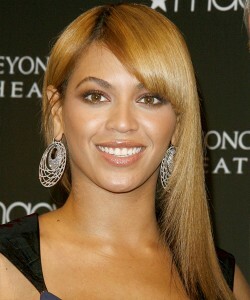 Whenever Beyonce sports a blond hair, she instantly looks radiant and more vibrant. This versatile hairstyle gives her an exquisite and glowing aura. Parted Long Curls. Beyonce always looks amazing with big, curly hair. Copper curls immediately add volume and texture making Bey look sassy and sweet. A fantastic red carpet style for the Queen Bey. It is a low ponytail with the tail curled so subtly with a curling iron. This fab hairstyle always goes perfect with her elegant gowns. For a rebellious look, nothing could go wrong with a rock star hair knot. Beyonce may look rebellious in it but in a good way since it gives her a chic and rock star aura. The rebellious knot can have a completely different vibe with a classic knot and when the knot is done slightly messy, it will automatically lessen age and with Beyonce’s case, gave her a naughty vibe. Only Beyonce could get away with a supersized mega bun for a hairstyle. Sprinkled with texturizer, teased and pinned in place, this look is one of her signature red carpet looks. A variation of it with braided hair at the base of the bun is also looked as lovely. Who couldn’t resist sporting a Disney inspired braided long hair? Beyonce surely could not and had a tightly braided hair that’s tousled and finished off with a curled fringe. It is a trendy look that also made her look vibrant with her highlights. There you have it, 15 Beyonce hairstyles that are worthy to be appreciated and become a source of inspiration. With her stature, Beyonce rocked all hairstyles with class and elegance. Her hair evolution that went from simple classic cuts to vibrantly fierce styles clearly defined her stardom.